We’d love your help. 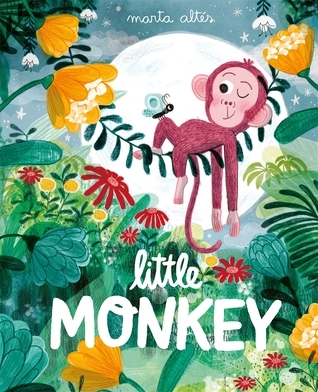 Let us know what’s wrong with this preview of Little Monkey by Marta Altés. "It's hard being a little monkey in a big troop, in an even bigger jungle - and this little monkey has had enough of always missing out! She's off to climb to the top of the tallest tree in the jungle and she's going to do it all on her own. Except that there's someone following close behind. Someone with claws and stripes and rather sharp teeth . . .
Little Monkey is a beau "It's hard being a little monkey in a big troop, in an even bigger jungle - and this little monkey has had enough of always missing out! She's off to climb to the top of the tallest tree in the jungle and she's going to do it all on her own. To ask other readers questions about Little Monkey, please sign up. La portada me atrapó en la biblio por su colorido, alegría y textura. Es una joyita. La historia no tiene giros tan sorprendentes como la del cocodrilo, pero fluye muy bien y ofrece el cierre necesario. Las ilustraciones son preciosas. 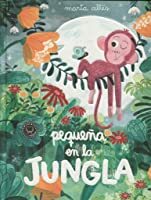 Beautifully illustrated book about a little monkey who feels left out because she is so much smaller than all the other monkeys. Positive message suggesting being different is not bad even if it seems to be to begin with. Darling illustrations, an endearing character, witty touches, an uplifting tale. Absolutely charming and wonderful! Love the illustrations, too! I have all of Marta Altés' illustrated children's books, she's my favourite children's book author. Little Monkey is an endearing and funny story of a brave little monkey that goes off to discover the world and comes back appreciating what she has back home. The illustrations are gorgeous, made with watercolours and coloured pencils; a delight to the eyes. Lovely hand made letters and beautiful colour palette too! Highly recommendable. first picture book of the year for me. super cute story. i wanted to keep looking at the fun illustrations. 4 stars. The artwork in this book is nothing short of a masterpiece, the level of detail in each page is simply stunning. The story itself is packed full of the charm and wit we've come to expect from Marta Altés, I can't wait to see what she comes up with next! Marta Altes loves to tell stories and her love of illustration saw her study for a degree in Graphic Design in Barcelona. Marta moved to the UK to study for an MA in Children's Book Illustration at Cambridge School of Art (the best decision she ever made) and graduated last year. What she likes the most about illustration is that it allows her to bring a smile to the person looking at her drawings Marta Altes loves to tell stories and her love of illustration saw her study for a degree in Graphic Design in Barcelona. Marta moved to the UK to study for an MA in Children's Book Illustration at Cambridge School of Art (the best decision she ever made) and graduated last year. What she likes the most about illustration is that it allows her to bring a smile to the person looking at her drawings or reading her stories. Her first book, NO!, was published earlier this year (Childsplay) and MY GRANDPA will be her debut book with Macmillan. Marta divides her time between Barcelona and London.